6 m of textual records. -- 6 film reels. Michael Waldichuk was born in Mitkau, Roumania on October 23, 1923. He received a B.A. Honours in Chemistry (1948) and an M.A. (1950), both from the University of British Columbia, and a PhD (1955) from the University of Washington. His dissertation was entitled Physical Oceanography of the Strait of Georgia, British Columbia. In 1952 he began a long career with the Canadian federal government, as Associate Scientist with the Fisheries Research Board of Canada, at the Pacific Biological Station at Nanaimo BC, where he was appointed Oceanographer-in-Charge of the Pacific Oceanographic Group in 1966, and as Program Head of the Pacific Environment Institute (now the West Vancouver Laboratory of the Department of Fisheries and Oceans). His area of expertise was the impact of industrial pollution on marine organisms, particularly the effects of coastal pulp mills and effluent disposal systems. Waldichuk’s work included design of outfalls, studies of oxygen diffusion in still seawater, disposal and effects of organic, radioactive and heavy metal pollution and pulp mill waste. An obituary from Canadian Journal of Fish and Aquatic Science, written by colleague John C. Davis notes that Waldichuck “played a major role in investigating and advising on a variety of important and highly visible West Coast issues including the disposal of mine tailings in Rupert Inlet and the Roberts Bank port expansion” as well as a number of assessments of important BC estuaries. He served on many national and international committees and working groups, including the US National Academy of Sciences’ Pacific Coast Working Group on Low Level radioactive Waste Disposal and the International Maritime Organization’s Joint Group of Experts on the Scientific Aspects of Marnie Pollution, or GESAMP (1969-77, 1984). He was also the Director of the Canadian Association for Water Pollution Research and Control (1967-68, 1971-76), a member of the British Columbia Research Council, the Chair of the Canadian National Committee for the Scientific Council on Ocean Research (1989-1991), and a member and vice-president of the Board of Governors of the Vancouver Public Aquarium Association. Dr. Waldichuk died May 4, 1991. 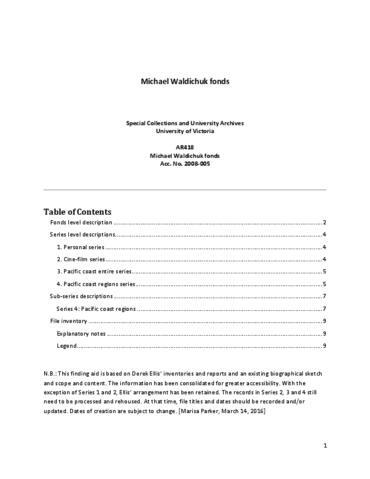 Fonds consist primarily of the correspondence and manuscripts of Dr. Michael Waldichuk specific to environmental issues on the Canadian Pacific coast. The fonds consist of four series: Personal, Cine-film, Pacific Coast Entire, and Pacific Coast Regions. The Personal series contains correspondence, records containing information about Dr. Waldichuk’s academic and professional career, and a bibliography of publications written by Dr. Waldichuk. The Cine-film series consists of 275 metres of film documenting survey procedures, particularly at Crofton Pulp Mill. The Pacific Coast Entire series consists of documents relating to the Pacific Coast as a whole. Pacific Coast Region consists of documents organized into 15 sub-series identified by environmentally distinct regions. The fonds also contains publications received by Dr. Waldichuk in the course of his activities. The fonds were transferred to the UVic Special Collections and University Archives by the Pacific Biological Station Scientific Archives, Nanaimo, B.C., in 2008. The donation was facilitated by Dr. Derek Ellis. According to the inventory prepared by the Pacific Biological Station (PBS), Dr. Waldichuk’s records were stored in rough chronological order in piles and on shelves in his office, basement, garage, and home. In accordance with Dr. Waldichuk’s will, the Waldichuk family removed private materials, magazines, journals, and other publications prior to possession by the PBS. Gordon Miller, Keeper of the PBS Scientific Archives, rehoused and inventoried the materials. Each file was assigned a box/file number and a chronological-topical designation. The PBS did not intellectually arrange the fonds. In 2009, Dr. Derek Ellis undertook the arrangement and description of the fonds. Under the mandates of the Environmental Science Archives (ESA) and the Marine Environmental Science Collections (MESC), Dr. Ellis removed materials that are not relevant to Canadian Pacific coast environmental issues and/or were not authored by Dr. Waldichuk and placed them in the MESC. Dr. Ellis retained materials that are relevant to the Pacific coast, including publications, within the fonds. At this time, Dr. Ellis discarded damaged films, duplicate publications, and other materials that were not selected for retention. •	Series 2 in Dr. Ellis’s arrangement (Bibliographies) contained only two items; both were moved different locations. A bibliography that was original to the fonds was moved to Series 1. The bibliography compiled by Dr. Ellis is available in the finding aid folder. •	Series 5 in Dr. Ellis’ arrangement (Cine-film) was renamed Series 2. The arrangement of Series 3 and 4 has not changed. Dr. Ellis’ arrangement of these series is based on environmental regions. File inventories are available for each series. File titles, notes, access points, and the majority of dates were supplied by Dr. Ellis. The PBS inventory and Dr. Ellis’ file lists and bibliography are also available. Reports, correspondence, and other records created by Dr. Ellis in the course of his arrangement of the fonds are available.